What to do with this jar of nectar concentrate? In a fit of preparedness, I made a couple quarts of my special hummingbird nectar concentrate. It’s one part sugar and one part boiled water, and it’s sitting here in the refrigerator, waiting to be diluted (one cup concentrate to three cups water) and put in a feeder. But I look out and there are only a couple of ruby-throated hummingbirds buzzing around the salvias and cardinal flower garden. They’ve all taken off for the Gulf Coast, for Central America. I overestimated again. They won’t be back until mid-April 2012. And I already miss them. I miss the hum and buzz around the front door. I don’t miss having to wash and refill the large-capacity feeders every other day. I don’t miss having to lug the 16′ extension ladder into the living room from its summer station on the deck just outside. See, we have so many hummingbirds around the gardens and feeders that propping the screen door open to bring a couple of bags of groceries in is almost sure to net a captive in the house. 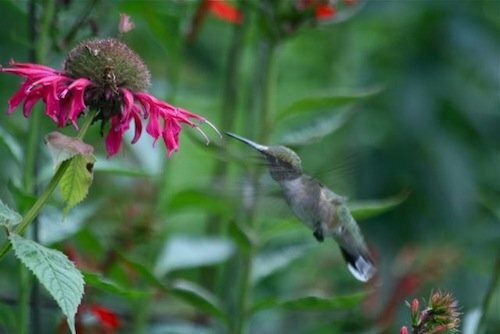 There is bee balm and red cardinal flower, blue and red and pink salvia; there are buddleias and crocosmia and gladiolas and larkspur; there is everything a hummingbird could want here in our gardens. 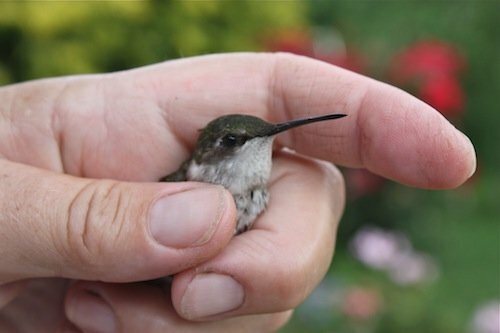 But they still come into the house when we leave the door open, and then we have to lug the huge clanky ladder into the living room and climb up to the clerestory windows to hand-catch the hummingbirds that fly into the house. 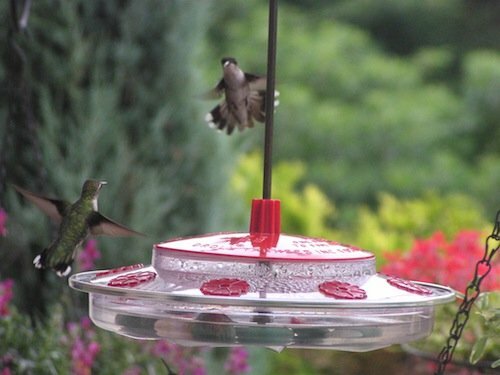 By the time I catch the hummingbird, it’s usually exhausted from buzzing against the window. (Hummingbirds, like most birds, fly to the highest point when they’re frightened, and that’s the very peak of our vaulted-ceiling living room). So I keep eyedroppers and syringes around that I fill with nectar when I get a hummingbird in the house. I hold the little creature in my hand and stick its bill into the syringe. If you ever do this, don’t be unduly unnerved by the little thin squeal of fright the hummingbird gives when you catch it. They mew like kittens in the hand. Oh! it’s surprising and disarming, but it doesn’t mean the bird is dying. It’s just afraid. Be patient, keep that bill in the syringe, and wait for them to realize what you’re doing–trying to help them. It doesn’t take long before that little thin transparent rice-noodle of a tongue starts lashing in and out. I like to send them off with full crops. A newly released hummingbird will fly up, up, up, as high as it can, before leveling off and getting the heck out of Dodge. I love watching that, sending them back up into the sky with a kiss on the top of their flat little heads. Delighted to say that as you read this I’ll be hanging with Corey at the Midwest Birding Symposium. I haven’t seen him since our trip to Honduras in 2009–pre-Desi! And as I write this, I cannot wait to see him!! If you didn’t make it this year, plan to come see us in 2013. MBS rocks out loud. 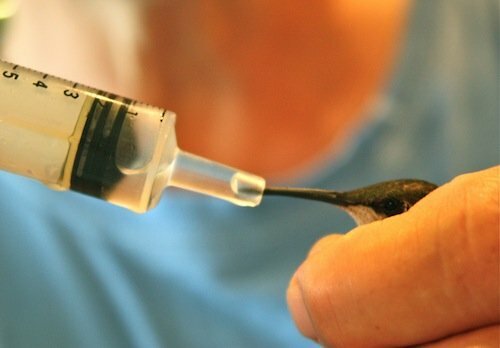 Nice idea to feed the accidental house hummingbirds with a syringe. As for the left over simple syrup. . . mojitos? I don’t know if you are ‘in’ to moths, but hummingbird nectar sounds like the sort of stuff that entomologists use to attract them – try dipping a piece of cloth or rope in it and hanging up outside, then visiting it later after dark with a torch – you might be surprised what shows up! Wonderful hummingbird pictures and information. And Chet Baker, too. Love it. This is so amazing that you could catch this little one, they look fragile to me. when I visited LA two years ago, I tried to take pictures of one of these species but I need a bigger lens. Love what you do with it.